51 days until I start law school.... that blows my mind. Needless to say, I am on the backstretch of the preparing for law school stage. This summer has been dedicated to two things: my wedding and preparing for law school. Now that my wedding is just 2 weeks away and most of the prep is done, it is time to shift some of my focus to law school and how I must prepare myself for that. Below are the 10 major ways I am preparing for law school. I challenged myself to do a lot of pleasure reading this summer for two reasons. First, I love to read and during the school year I have little time for it. Summer is my time to catch up on all my favorite books. Second, I am working to get myself into the habit of reading A LOT. I hope that having that habit well established will ease the transition to law school and all the reading requirements. I wanted to make a point to improve my eating habits to help get ready for my wedding but also to start law school healthy. I want to be in the habit of eating good food that feeds my brain and my body. You are what you eat and I don't want to start law school feeling like McDonalds. Also, starting that habit now will help me to keep it up during law school. I have spent a lot of time this summer researching good study methods in general and specifically for law school. I have found some great resources online that explain general study methods and the science behind what works and what doesn't. I suggest just googling "good study methods" to find some interesting articles. I love reading the tips from fellow blogger, Brazen and Brunette. She is a rising 2L and gives some wonderful insight into law school life as well as study methods that work and don't work. Her blog is a wonderful resource for any soon-to-be law student. I have spent a lot of time organizing my life. I have organized all my files on my computer for ease of saving and organizing my law school files. I organized and cleaned out my whole desk and I am in the process of setting up the office in our new house as my little study haven. I am also getting a Plum Paper Planner as they seem to be the best planner ever from everything I see online. I am a planner freak so having the perfect one for law school was a must to get myself organized. My planner is ordered and I am dying for it to arrive! I spent a few long days cleaning out my closet and dressers. I am trying to "professionalize" my wardrobe in preparation for not only law school but a career as an attorney. Getting new clothes is fun but finding space for them was not. I tried to purge my wardrobe of anything I haven't worn in a year, things that were too big or too small, anything super childish and anything I would be embarrassed to attend a law school class in. This gave me room to add my new, professional, adult clothes to the wardrobe. (Also, my new house has a walk in closet and it is a lifesaver). I do not have my first day assignments yet but as soon as I know, I will get down to business on reading those cases and being as prepared as possible when I walk in the door on August 22 for my first law school class. New university, all new everything. I have to get a new student ID, parking pass, email, etc. Setting up all this new stuff and trying to navigate a new University will definitely take some time. Also, just going and visiting a few times to get a feel for the layout and setup will help to make day 1 that much easier and more comfortable. All those Netflix shows I have in my list but never have time to watch? Time to watch them! More specifically, anything law related. I do not want to be the one law student who has not watched Making a Murderer. Another post coming soon on what shows exactly are on my must watch list! Law school is going to be really hard and really stressful. I am tryig to make a point to relax this summer and get myself in a good frame of mind for the beginning of law school. I have made it a point to spend a lot of time watching The Office with my fiance, playing with my pups, riding my horses and making time for things I enjoy. It is so easy to get busy and for life to get chaotic and for yourself to become a non-priority. There is plenty of time for that in law school; this summer, I am a priority and my relaxation and happiness is a priority in my life. 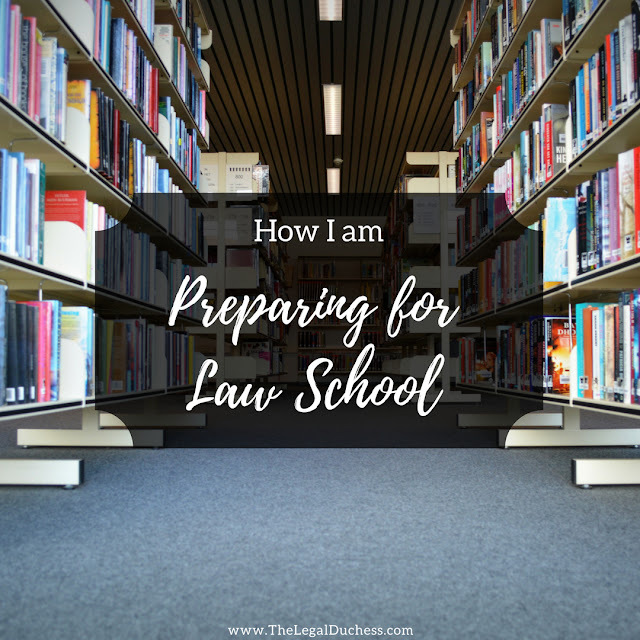 What are you doing to prepare for law school??? Omg crying right now thank you so much for the recommendation! But you have some excellent tips as well!! You're going to do great this year! I sure hope so! Reading your blog has certainly made me feel more prepared!